Brought to you by TJ13 Courtroom Reporter & Crime Analyst: Adam Macdonald. Grosjean’s form continued, Webber had a Webber like start (or at least Webber like luck) and the inevitable dominant display from Sebastian Vettel meant a procession like race in Texas. Nevertheless, the Austin crowds loved the race on what had the potential to be the warmest day on record in November in Texas. It seemed strange to see how quickly the circus leaves town after the spectacle of the race is finished. 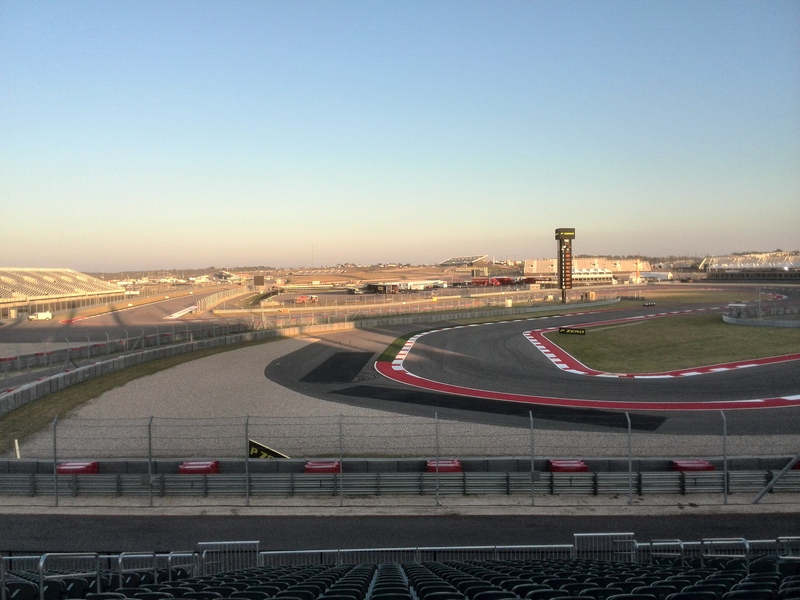 The picture below was taken from the turn 15 grandstand at 5pm, just 2 hours after the race. The tranquility of the area was a far cry from the eardrum bursting scream of the V8 engines earlier in the afternoon. The analogy of Formula One going in and out of places like a hurricane suddenly made sense. 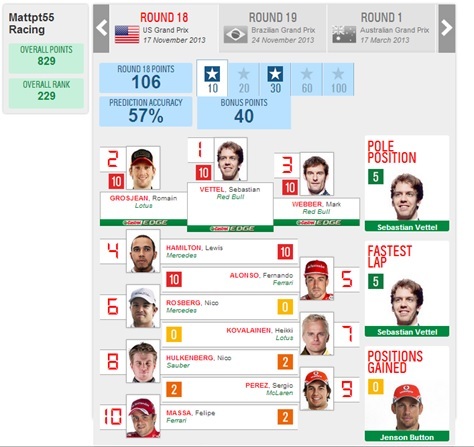 Whoever says that home advantage is non-existent will be swallowing a bitter pill with the news of Mattpt55 Racing scoring a staggering 106 points at the team’s home GP. Predicting the top 5 correctly was the major contributor to this, with pole position and fastest lap further aiding the cause. An 8 position jump leaves the team 12 points clear going into Brazil. It’s all to play for now! 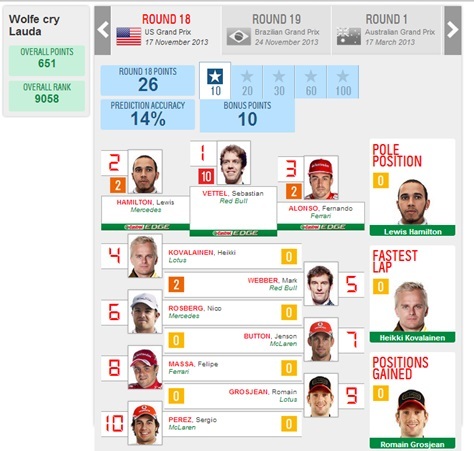 On the other hand, Wolfe cry Lauda did not fare so well. Dropping 7 places at your home race is never nice, but a Heikki Kovalainen prediction of 4th was always going to be a long shot. Valtteri Bottas tripling the Williams constructors’ points to really rub salt in the wounds of Pastor Maldonado caught many of us out. The driving pairing will be strong for the Grove based team in 2014, so what’s to say this upsurge isn’t the start of something huge from them? If there’s rain in Brazil then it really will throw the cat amongst the pigeons. Which race this year has seen the smallest margin of victory and what was the time difference between P1 and P2? The question was: The last time Fernando Alonso finished a race outside of the points was Silverstone 2010. This will be a race we all remember for different reasons though (Ahem…Number 2 driver). Alonso finished the race in 14th position, but where did his teammate (Massa) finish? Answer: The answer was down in 15th place. Alonso had received a controversial penalty in the race for the way in which he had passed Robert Kubica. Congrats Mattpt55 but i thnk i did one point better!…lol go Team Hami whoo !! Well, I did come here to do a bit of humble bragging, thanking my mentor Dr. James Beck and to assiduously deny rumors I have been running 1000’s of Monte Carlo simulations on my PC with the Pirelli strategy predictor. While it is true that the software exists on my PC, you see I haven’t been actually USING it so technically it’s not a violation of FIA regs. The Stewards will certainly back me on this. LOL, more like a broken clock am I. Capirinha’s here I come!!! Ahh congratulations on taking the lead Matt! Good old Benetton 1994 excuse there! So close on bagging the extra 60 points for 6 of the top 10! That would have seen you pretty much home as TJ13 Racing League champion! I was gutted we didn’t have a page for Abu Dhabi – I was in a similar situation there and got 5 out of 10, jumping up 7 places! Damn, just one right switch away from taking the lead of the league, prior to this race! I had a few 5’s as well…. It would have also boosted me way up the global league, I think a few pages off the front. Amazing. I’m sure we could have someone actually win the whole thing next year. I hadn’t even considered the prize was winnable at the start, and here we are actually getting quite close. Scherzinger’s Rejects was right at the top of the global leaderboard for a while in the first half/mid-season, that was when I really got that we could be competitive on a global scale! Even though the judge mentioned competitors doing well last year! After not really getting the predictions at the start of the season, I’m really getting into it now, and that Abu Dhabi race was my best in terms of prediction. Possibly the easiest one to get almost right as well though so I was rather lucky there. Mid season I started ‘playing the percentages’ and the crowd power to try and make up ground in the league. Trivia: I’ve only bet on horses twice, as part of a 4 bet for a 15 on 1 bet. My friend told me how to look at the form tables and use that, and my two won, one of his won and he made a good £20 or more from a few quid bet! It’s a similar story in the casino and in the stock market.. maybe there’s something worth investigating here! Next year: aim is Monaco! Yes, many thanks and I believe you have adequately summed up my retirement strategy LOL. And excellent spotting of the Benetton excuse, the old ones really are the best, aren’t they. AS for nailing the top 6, it would have been amazing, but sadly out of reach after Rosberg’s poor Quali (reminds me I need to have a chat with Ross about that). The truth of it is I spent a big chunk of the race rooting for Webber to pass Grosjean, not because I was a Webber fan but because I thought I had a Red Bull picked first and second. So it was a real surprise to get the email. I’d been on a solid 36 point average so I really have to see this as more of an outlier. I can’t believe they robbed you of your glory in Abu Dhabi though. That hurts, I know. Still, to be in with a chance is all that you can ask heading into the last race. I know I jumped an astonishing amount of places, but globally there was someone on my page who had jumped almost 5,000 places. Because of time differences I’ve actually done a number of my own analyses based off of Dr. Beck’s method (simplified of course) and I have found trolling through the FIA timing data to have been really illuminating in terms of appreciating the finer points of racing and strategy. It’s just endlessly fascinating, so much so that I want to go back through all the races just to see if I can pick up on any new indicators for next season. It’s too bad we can’t all compete as a team against other leagues, TJ 13 vs. the World. Maybe best league average or something of the sort. Would make it even more fun IMO. Matt, we are looking to start an odds analysis page from next season onwards. Would definitely be interested. Let me know. TJ13 has my particulars. Would also like your help with an article on broadcasting…. Not so sure about the US side of this if you would be able to help? Absolutely. Just let me know what you need. Yeah, it looked like you were quite busy in the meantime! No worries! I thought probably getting to Austin and all that organisation must have taken a good few days. It was more the car breaking down nowhere civilisation. An experience nevertheless!